STORY: As the Himalayan states of northern India received its first snowfall, the local residents of Jammu and Kashmir on Saturday (November 03) expressed their happiness to witness such heavy snowfall in the month of November after almost 10 years. 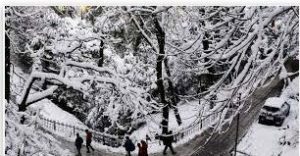 The summer capital of Kashmir, Srinagar received heavy snowfall as roads, trees and rooftops were covered with snow, presenting an enchanting view to the tourists and residents. A local resident Syed Await said that he’s extremely happy due to snowfall as it attracts tourists and helps in improving the economy of the state.